I Skate, Therefore I Am: Is the new search for Animal Chin leading to the US desert, China or David Ricardo? Is the new search for Animal Chin leading to the US desert, China or David Ricardo? In 1987, Ex Z-Boy Stacy Peralta, and future skate legends Tony Hawk, Steve Caballero, Mike McGill, Lance Mountain, Tommy Guerrero, Rodney Mullen and Mike Vallely (collectively know as The Bones Brigade) traveled to different skate spots around California, Nevada, and Hawaii in search of a crumpled old wizard called Won Ton the "Animal Chin”. After much searching and skateboarding, they eventually locate a large ramp in the desert and a Chinese character on the inside of the ramp's spine. They conclude that in searching for Mr. Chin, they may have found his spirit. With a score coincidentally composed by Dennis Dragon, Stacy Peralta’s Search for Animal Chin is of the kind of old-school nomadic, skate-everything-in-your-path iconic movie with interludes of stopping to rip-up a big ramp, pool or kicker. 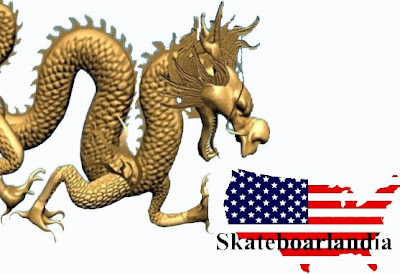 Beside, it is the first attempt at reconciling skateboarding and China way before China became the savior of the world in general and the US in particular with its strong currency and its savvy economic policy. Twenty years after the visionaries at the Bones Brigade really went into finding Animal Chin, and what he stands for (They don't call him commander fun for nothing), i.e. Understanding and Respect for Fun, a controversy sprouted in the skateboard industry on whether or not skateboard decks made in China were good enough for skateboarding. Yet, does this really matters? To the vast majority of skateboarders, the country of origin is totally irrelevant when it comes to balance out the pros and the cons of buying a board. However, to a tiny minority, buying a skateboard from abroad is akin to national outrage or, in times of war, even to treason…The word out there was that “Chinese boards broke easier” or “Chinese boards delaminated too fast”. Similarly, you could argue about whether or not buying products from China upholds human rights violation or leads to more freedom. On the other hand, you could also argue that capitalist countries don’t take better care of their people, especially health and the environment than China. But, really, is there really someone left here who cares? If China is really on the verge of becoming a superpower and what international relation pundits call an hegemon, all of the blabbiness are only stupid generalizations that, most of the time, are not even true and for a variety of reasons. Let’s start with how boards are made. The current trend is that boards made from Canadian maple are the best. Actually, Canadian Maple has been the standard for over 30 years in the skateboarding industry. OK. However we also find on the market boards made of China Maple and bamboo. Several skate companies are taking advantage of the resistance and green image of the bamboo for their decks: Habitat, Element, Zazzle, & Sector 9, etc... However, a good rule of thumb would be to ask your local skate shop for a deck that is made of 100% Rock Hard Canadian Maple Moose Decks because softer wood won't have good pop, and definitely won't last. So, the #1 rule is to make sure the deck is made from 7 ply rock hard maple from the Great Lakes Region. - A blank deck (which is know as generic deck). Those decks are generally very inexpensive but the quality is not guaranteed. A lack of guarantee does not mean that the board is bad, that just means that you can’t preemptively guess the quality of the board. You may break the board after a couple of sesh, but you could also keep it for months or years. Evidently, it all depends on how aggressively you use the board. If you are a beginner, a blank deck might be the perfect board to start with. Obviously, if you choose a blank deck the reason is for its low price. On the other hand, there are a lot of people in the skateboarding industry who recommend not to buy blank decks because, to the extent that you aren't supporting pro skateboarding you are helping to undermine skateboarding as a whole. - A brand deck (which is a deck from any known brand, say Zoo York, Flip, Enjoi, etc…). Those are generally more expensive and not always because the quality is better. They are more expensive because the brand has to add the cost of its marketing, advertising, web presence, etc into the price of the board itself. On the other hand, because the brands put their names and reputation on the boards they sell, they have an incentive to have their brand deck made with quality products otherwise they are immediately doomed. - A pro deck (which is a brand deck with the name of the pro). Those are supposed to be the most expensive boards because brands have to pay royalties to the pros. So, whether or not a board is made in China, Mexico, Canada or the US, what is important is not the country of origin but the materials that are used in its composition (including the wood, the glue, the epoxy, the press, etc…) and the market target. For example, the resin 7 epoxy construction decks are lighter, stronger and stiffer than standard 7-ply decks and keep the pop longer; and most of them are made in China. Is it better to buy a US board made with poor materials or a Chinese board made from up-to-date technology? Apart from bad quality and appalling working conditions the argument against buying Chinese board is US pride (you don’t want to see another product being made overseas because it is putting US companies out of business and their workers out of jobs by shifting production overseas). A little bit of A to Z economics is needed here: David Ricardo’s principle of Comparative Advantage refers to the ability of a firm to produce a particular good or service at a lower opportunity cost than another party. Comparative advantage is the ability to produce a product most efficiently given all the other products that could be produced. Not only Comparative Advantage explains how trade can create value for both parties even when one can produce all goods with fewer resources than the other but also why the net benefits of such an outcome are called gains from trade. The comparative Advantage is the main concept beyond the theory of international trade. Put it into everyday English, Comparative Advantage is what laymen call a Win-Win situation. The customers in the US buy the product at a cheaper price because the production has been shifted to a low cost country were wages are depressed, that frees labor in the US, that in turn can take advantage by working in high end positions, such as imports, marketing, distribution, sales and management. Another argument in favor of making skateboard decks in China is price elasticity. Price elasticity is defined as the responsiveness of the quantity demanded of a good or service to a change in its price. It is percentage change of quantity demanded by the percentage change in price of the same product. Price elasticity is used every day at Big Box retailers (usually grocers), and believe me, not only this works, but this works like crazy. Of course, it all depends on the product but, price elasticity means that, in some instances, if you drop the price by only 20%, you not only sell 20% more but 200% and sometimes 2000% more. So it all depends on whether we want to keep skateboarding to elites by artificially keeping prices high or if we want to mass merchandise the sport and crossover to mainstream market. And there is no doubt that skateboarding, thanks to price drop is now a mass market. And again, the more decks sold, the more people are needed here, in the US, to work in distribution centers, marketing and sales, and related jobs. Then there are the collateral sales. 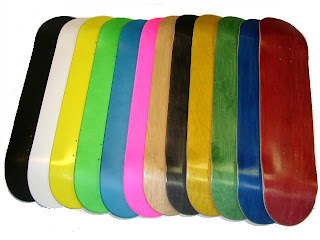 For each skateboard deck sold in skate shops or else, there are hundreds and possibly thousands of shoes, tee shirts, apparel and accessories sold and that is actually where the money is made. Has the deck itself turned into a loss leader?